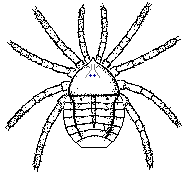 Description: Palaeotarbus jerami, Silurian trigonotarbid arachnid Ref: Dunlop, J.A. (1996-09). "A trigonotarbid arachnid from the Upper Silurian of Shropshire". Palaeontology 39 (3): 605–614. Retrieved on 2008-10-12. The fossil was originally named Eotarbus but was renamed when it was realized that a Carboniferous arachnid had already been named Eotarbus: Dunlop, J.A.. "A replacement name for the trigonotarbid arachnid Eotarbus Dunlop". Palaeontology 42 (1): 191. This page was last modified on 20 April 2017, at 14:52.